So I had to find out what's this thing is all about. Well turns out that this article quotes a young and a handsome PHD from Harvard by the name of Mathieu Lalonde. 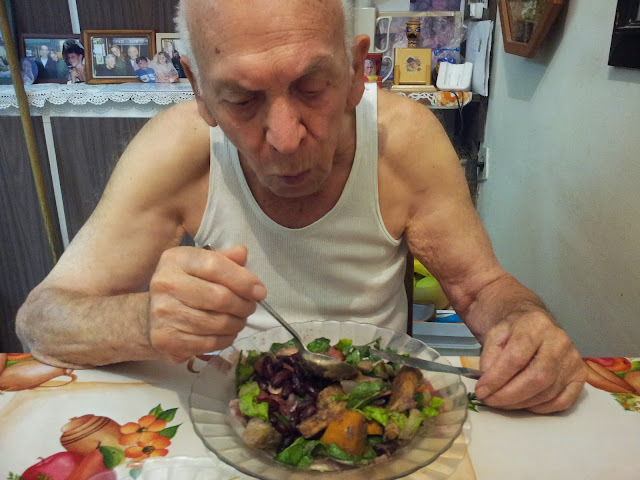 He is one of the Guros for the Paleo diet. Apparently there are many people adopting this Paleo diet which advocate us eating like our ancestors - mainly proteins, that is meat, pork, that stuff. And so this guy did some work called "Nutrient Density: Sticking to the essentials". You can watch it here. Look, I am not qualified to judge and give marks here to these people. Apparently they have some logic behind all the fuss. I shall read about it - I always read about the enemies before I decide to mock them or... join them. I mean right now I am busy reading a book about finding wild nutritious plants growing in our back yards. You can't imagine me reading a book about how to catch cats or even the little cute rabbits growing in our backyard. 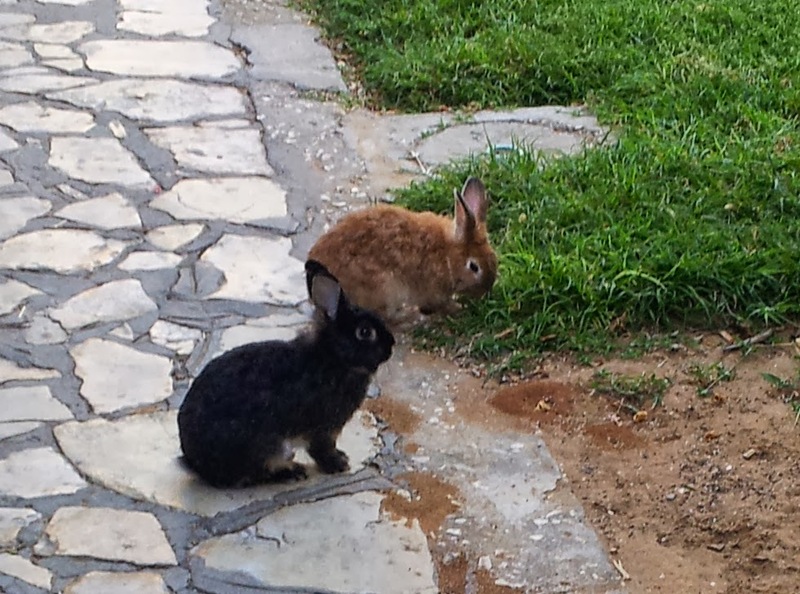 And here's a picture of them if you don't believe me!!! That said, those of you that do know me, are well aware that I can kill if I have to. I mean I have killed several times in my past when my survival instinct came into play. If I shall be convinced that this Paleo thing is the best next show in town then I shall toss this vegan/nutritarial thing aside and do the right thing. But for now, I can't wait till I am fully educated - I am just executing on my diet and the results, so far are amazing. How come I have been preaching about nutrient density and how vegetables are winning and all of a sudden comes this young man and say such things? The answer is simple. It's the definition of what nutrient density is. 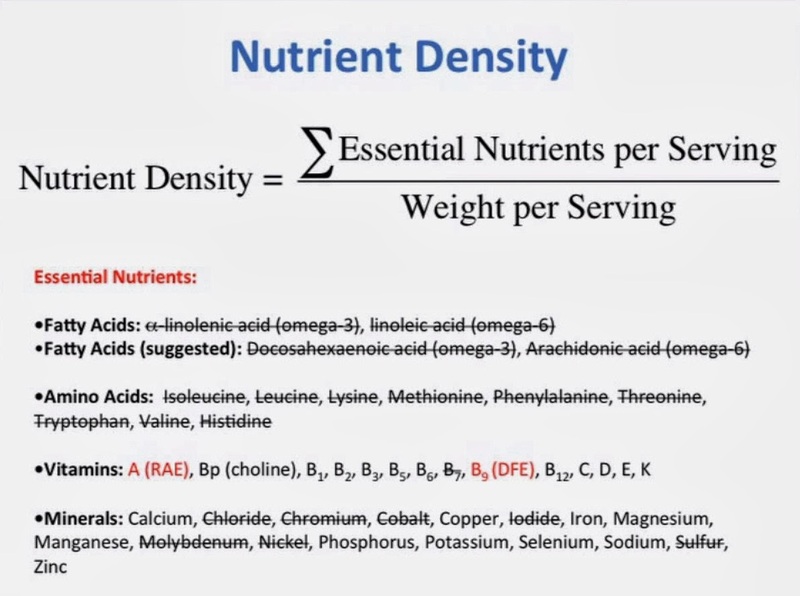 I am adopting the calorie restriction society as well as Dr. Fuhrman's definition as well as many other scientists : density = N/C = Nutrients / Calories. If you want to lose weight and live longer then you want to pay with as few as possible calories in order to get as many nutrients as possible. Now comes this PHD and explains the following. What is it that we are looking for - we are looking for the amount of essential nutrients divided by volume. First of all if he puts something with 0 calories in the denominator then he has a math problem. Now come on, so just because you have to deal with water having 0 calories - you are not going to use calories in the denominator? And here comes his second argument which is absolutely unbelivably biased... and I quote "If you have a food that is very nutrient dense but also caloric dense dense then it’s not going to get a good a score as a food that has the same nutrient density but has fewer calories"
You will have to read this few times in order to understand what this guy is actually saying. He is saying that if you have meat (which is nutrient dense but caloric dense) then it's not going to get a good a score as a vegetables (which is nutrient dense but has fewer calories). Now think of yourself, a harvard student, sitting there listening to this crap and in front of you there's this good looking, so sure and so full of himself PHD saying this stuff with a serious look on his face. You wouldn't have no time and no courage to even understand that this is all wrong. 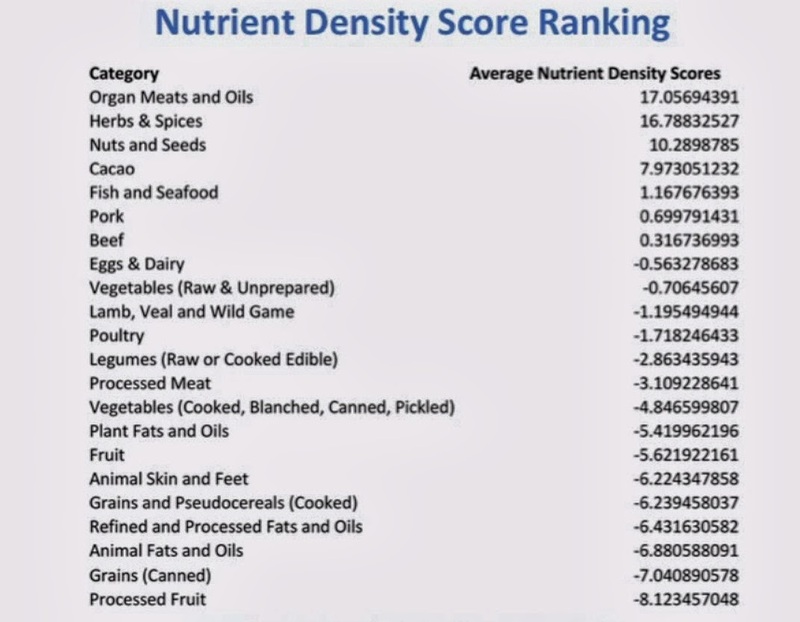 But before you contemplate what to do - this young PHD puts the following definition to nutrient density while saying "So I decided to use the weight per serving"
He also says "If you have someone who needs to lose weight then - sure stay on moderate to high nutrient density and moderate to low calorie density. (but if) you got an athlete... increase the calorie density of the food that he eats (no matter what the calories are)". He actually agrees that if you want to lose weight then you should adopt the N/C model. He actually says it! And then he goes on to say that it doesn't work for athletes. So he prefers to feed us Athletes diets while some of us would just like to lose weight! Well people have already thought about it right? 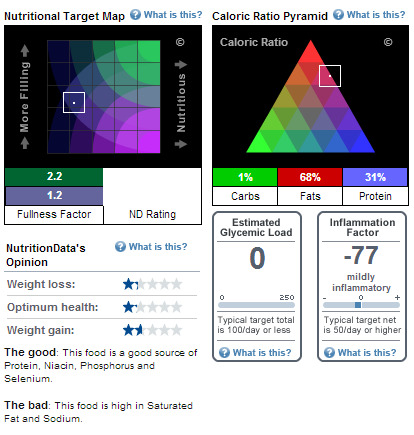 I mean using the N/C nutrient density and fullness factor you can aim to any of the quarters in the nutritional map. Remember? You want to lose weight - go for the upper right corner. You want to gain weight - go for the lower right corner. both corners are high in N/C nutrient density. You want to be a fat slob - for the upper left corner. You want to die - take the lower left corner. So easy, so simple. Let us decide what we want to do - don't eliminate those of us wanting to lose weight. So AFTER saying the above he says... "So I decided to use the weight per serving". You see? This guy is very scientific and un-biased... - all he needed was to present ONE mistake and then move on with his wrong conclusions. One mistake - put weight instead of calories in the denominator. 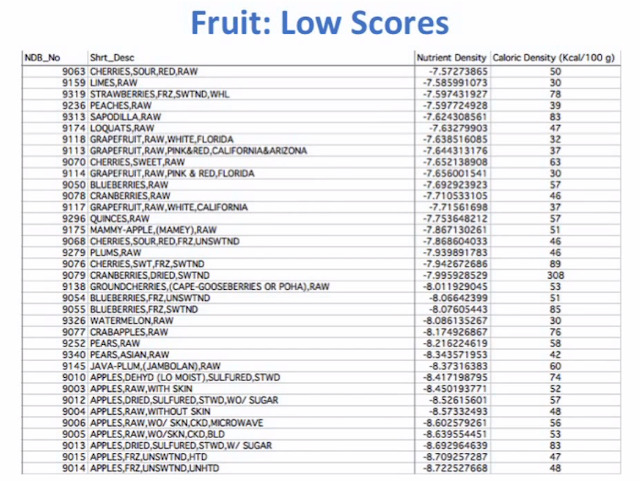 From that point on everything goes south in his lecture - all his nutrient dense winners are winners because they are high in calories. Yes you are going to get lots of nutrients if you eat bacon, pork and yummy red meat but you are also going to become very fat for goodness sake. And then when everything is twisted he can compare eggs white who have less calories than egg yolk. I mean people are eating only the whites cause they want to get as many proteins as possible without being fat. Here comes our genius young PHD and at about minute 19:40 jokes about it "sorry but for those of you who eat eggs whites for omlates, I will take the yolk".... Yea he will take the yolk just because he didn't take into account the price that he has to pay - the calories! So starting with an ambitious goal of really including all essential nutrients he had to remove from the list. He doesn't have any of the fatty acids, he doesn't have any of the amino acids and no chloride, Chromium, Cobalt, iodide, Molybdenum, Nickel and Sulfur... And to think that 2 minutes before he was mocking Fuhrman. See how many nutrients are striked through in his so called index? One thing that he took out of the equation are the flevonoids. Hu humm - there are thousands of them and you can find them only in vegetables and fruits. Under the umbrella of trying to look as if he's an objective scientist he decided to look only on the essential nutrients. Well that's the first mistake. Who are you to say what's essential and what's not. How come you are so sure of yourself that flevonoids are not important? And of course he then decided that sorry fibers are not essential so it's taken out. Yep, it's taken out because vegetables have them and he would like the Paleo guys to cheer for him. He then goes over the food groups and tries for some reason to find the best and the worst food in terms of nutrition. This is of course completely twisted and one can clearly see that those foods that are winners in terms of food density cost tons of calories while the losers just don't have enough calories in order to compete. All of this could have been saved if he only divided his results by the calories and then sort again. Look like apples are not that bad - they are actually in the upper right quarter which means they are quite nutritious and when you eat them you don't want to eat many more - that is their fullness factor is quite OK. On the right side you can see the caloric ratio - only 3% fats. The young PHD advocates eating pork. 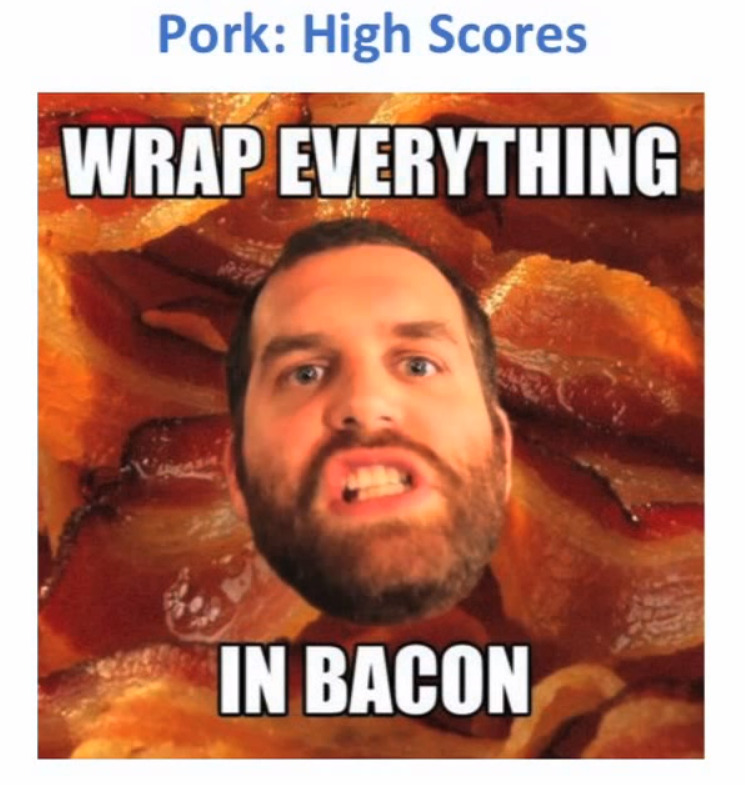 That's right, after reviewing all of his twisted nutrient density calculation he's recommending to wrap everything in bacon. And the crowds cheer. Let's look at pork nutritional maps - let's take the winner of the pork winners. 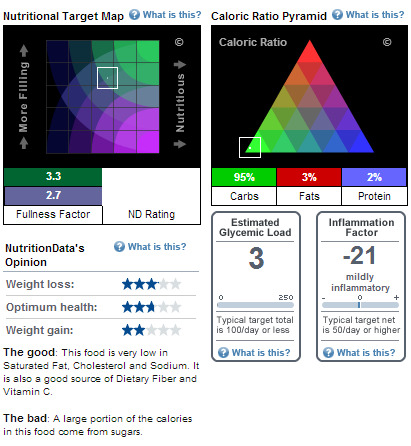 I mean it's full of fat 68%, tons of calories and if you make your calculation - how much nutrition do I get for how many calories then actually this winner actually stands at 2.5 out of 5 and same more or less in the filling department. Actually this guy is located in the lower left quarter... I am not impressed. So this Mathieu Lalonde got it all wrong. Does it mean that all the Paleo diet is wrong? Well certainly if this is the way they organize their arguments then yea they are wrong. But I give them more credit than that, there *is* logic behind thinking about what's best for a man to eat in terms of evolution, survival of the fittest, etc. I am going to read more about this diet and keep you guys posted.